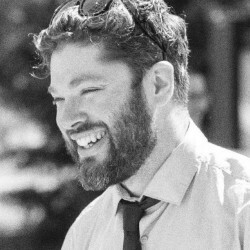 Darren Emerson (VR City) is a passionate advocate of VR story-telling and film making. 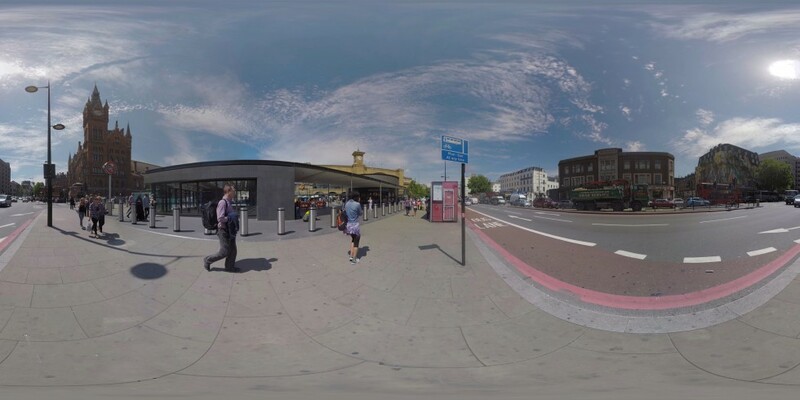 His VR film “Witness 360: 7/7” tells the story of a London 7/7 bombing survivor, from personal recollections combined with immersive imagery and abstract visual symbolism. It has played in competition at IDFA Doc Lab, and been part of Cannes, One World Humanitarian Film Festival, Docville, Docaviv, and MIT Virtually There conference. 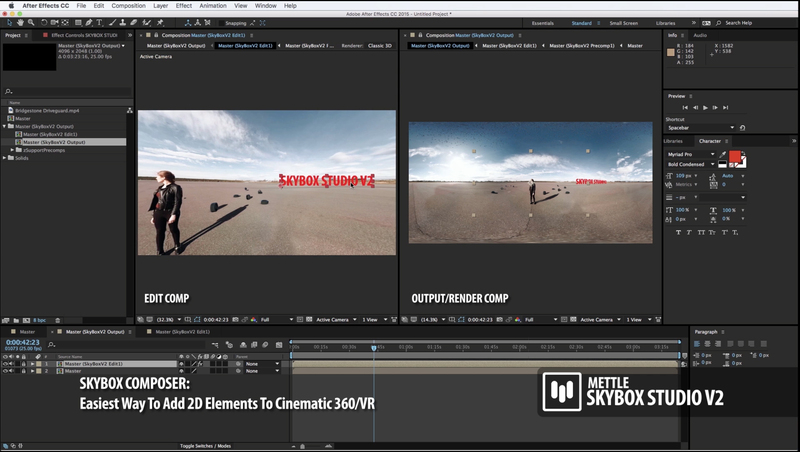 Adobe Premiere Pro and After Effects, along with Mettle SkyBox Studio, were used in his 360 production pipeline. What story did you want to tell? With Witness 360: 7/7 I wanted to make a documentary that asked questions about memory and trauma and how uncontrollable events can shape our lives, but not define them. It is a story of survival and resilience, and of moments of human kindness in the face of terror. The goal of the film was to take a global event like the London 7/7 bombings and offer a new narrative that focused on the emotional journey of one person. How did it begin? Did you know the survivor? We spent late 2014 and early 2015 teaching ourselves how to make 360/VR content, and by spring of that year I was ready to set out and try something more ambitious. 2015 was the 10th anniversary of the bombings and thought came to me that it would worthwhile to try and tell a story from the event. I did not know Jacqui Putnam before making the film, but found her through a charity that looked after a survivors group from the bombings. I spoke to a few survivors on the phone, but immediately felt that there was a connection between Jacqui and myself. We met for a drink and I knew from that evening that I wanted to make this film with her. We met again at her house a few weeks later and recorded an audio only interview with her. This interview is the basis around which the film was made, and it is this interview that you hear in the film. Jacqui is a powerful storyteller in her own right; she is able to articulate her story with feeling and honesty. You can hear her dealing with the emotions of the recollection as she tells it to us, and that in itself connects you to her story without the aid of visuals. 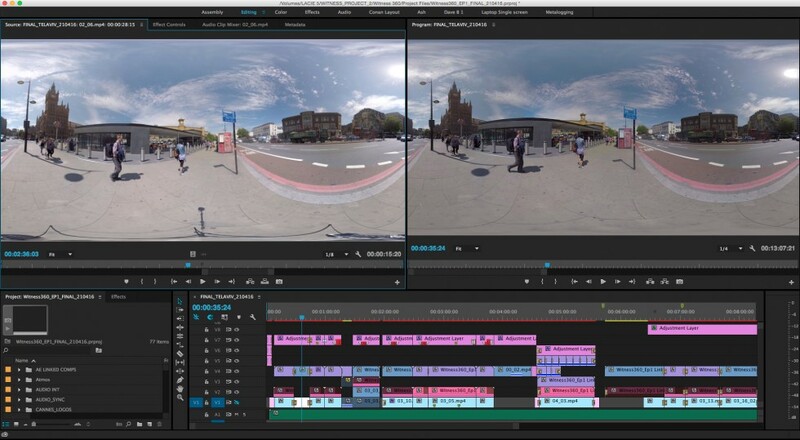 What makes you think that 360 is a better way to tell the story than 2D video? London 7/7 was a major terrorist event, like 9/11, Madrid and sadly the countless other that have befallen many countries and communities all over the world. In most cases we learn about these events through saturation with media that pervades every element of our daily lives. 24 hour rolling news coverage, twitter, Facebook updates; this is how were have become accustomed to receiving and the contextualizing events. In many ways I believe this sort of media coverage desensitizes us to the real experience of those events. I see 360 video, used particularly in VR headsets, as a way of reconnecting with something deeper, something more humanistic, more immediate more real. In this film we are with Jacqui throughout the experience, and it is now Jacqui’s very personal recollections that I connect with, and through her I feel connected to the other people that were on that train. I feel that VR can give us deeper layers of truth and insight; there is the narrative truth of Jacqui telling her story, the physical truth of presence within in a world that you can look around, and then finally an emotional truth that each individual brings with them into that VR space. When each person puts on the headset they embark on a unique experience, which goes beyond simply feeling a deeper sense of empathy within the immersion, but speaks more interestingly of the emotional exchange that exists between viewer and subject within the VR space. This is the effect not only of the interactivity and feeling of presence within the scene, but also the physical act of cutting yourself off from the everyday and obscuring your senses in order take in a new reality. Reduced down to your essence it is hard not to bring more of yourself and your inner reality into this new virtual world. For me this exchange between viewer, subject and director is what is really exciting about 360/VR filmmaking. What were your challenges, both artistic and technical? The main challenge of the film was how to tell a story where the major events depicted occurred 10 years ago. This was something I hadn’t seen at that time in 360, and we didn’t have the budget to do major reconstructions. I also knew I didn’t want to show archive footage within the film, although in certain circumstances this can help add context, I felt in this film it would remove the audience from the environment I was constructing. We talked to transport for London about filming on the tube network, and they allowed us to film for 4 hours for free. That meant I had to go into that shoot knowing exactly what I wanted, and to hope that we could execute it without any technical hiccups. Of course Go Pro rigs don’t like hot days on the tube, but we were pretty lucky as far as technical failures go, and resurfaced with some great footage. That shoot was really mainly the focus of the first part of the film, which is a visual retelling of the events of the fateful day in question, but the second part of the film I wanted to feel very different to this. The question I asked myself a lot was “what do I do once the bomb goes off?” The answer for me was to create a dream like space that was abstract rendering of Jacqui’s emotional state, where associated imagery and effects could take the viewer into a space that could be somewhere between life and death, consciousness and sleep. I feel the film tries to connect with something deep and unspoken within all of us. A shared humanity, which we feel once we give ourselves over to Jacqui’s story. What was your production pipeline, from shooting to final cut? What software and hardware did you use? Like any film the production process is pretty similar at the front end: with research, scripting, production management. But obviously shooting in 360 is more challenging, especially in early 2015. It feels like the industry has come a long way since then. Once we’ve shot everything we generally spend a day organizing rushes into camera and shot groups then do a pass in Kolor to create initial stitches. 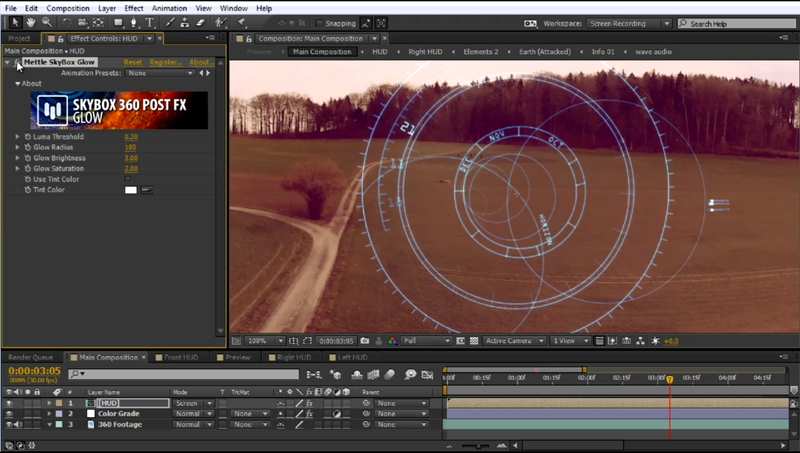 We export in Cineform and also create edit proxies to pull into premiere and start to build a narrative with. 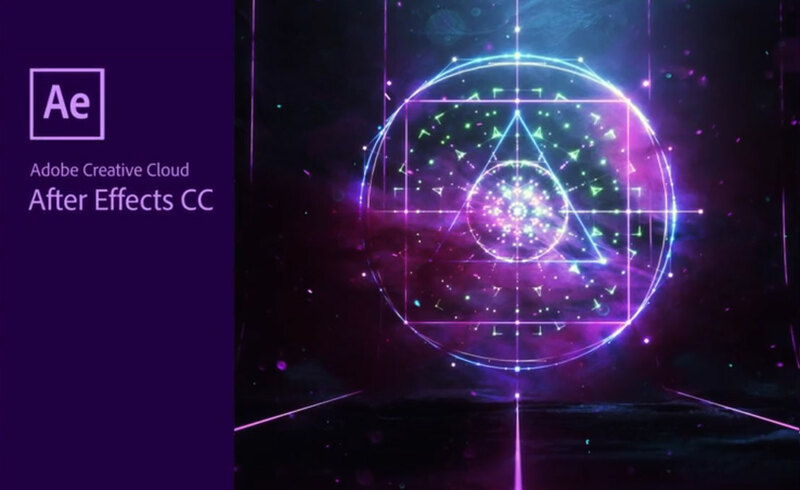 Generally once we have or are very near to a picture lock we will take our selected shots into AE and use native tools as well as Skybox to fix awkward stitches, do any compositing and perform rig removal. The way we worked on Witness was very ‘run & gun’ and on the tube was in very tight quarters with little to no control over the surrounding environment. SkyBox Converter plugin is ideal for rig removal, creating a cube map that can then be taken to PS for any painting out. I also find the ability to go into cube map and back to equirectangular especially helpful in some instances of masking over and around problematic stitches. We used the plugin feature Re-orient Sphere to reorientate the view of any shots we feel need it, previously we would have also worked with any text boards in AE to flatten them out in the sphere, with SkyBox’s latest Project 2D plug in for Premiere we just do that in Premiere now which really simplifies that aspect of post. I guess final pass would be to add sharpening to any scenes in need of it. 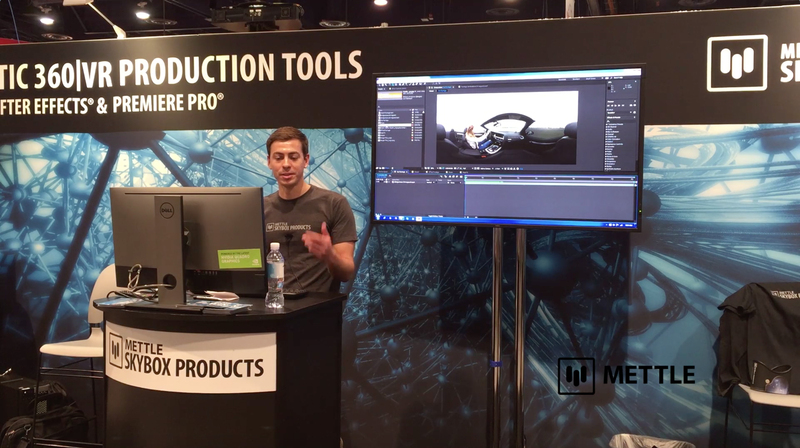 How did Mettle plugins make a difference in your production? Witness was made in July 2015 and feels like a lifetime ago in the world of VR. This was probably the first project we used SkyBox on and it was invaluable. 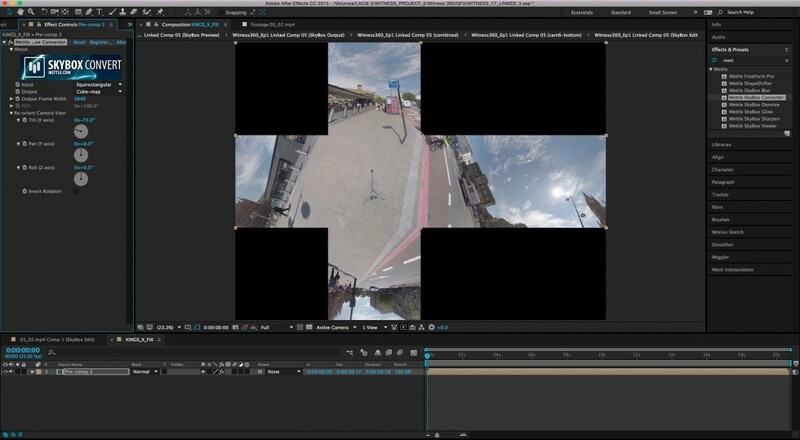 It allowed us to deal with and fix some of the issues associated with 360 film making in a much easier and intuitive way. 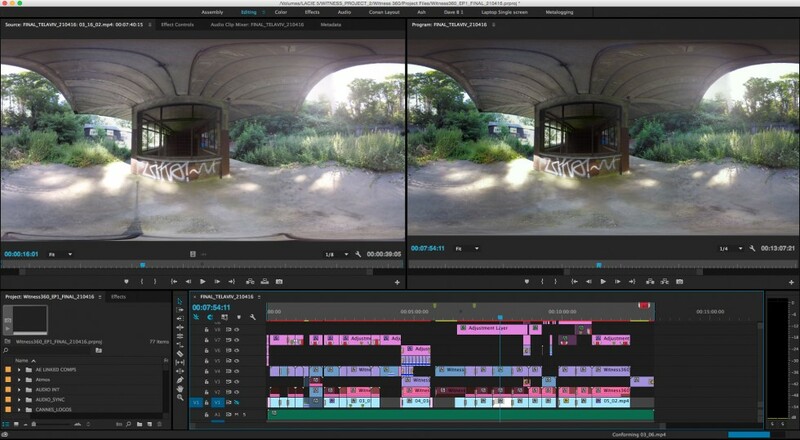 Coming from a background of traditional film making we are constantly having to remind ourselves of the constraints and differences between traditional and 360 film making but it seems that the Mettle plugins are beginning to break down that barrier and allow much more traditional film making tropes to be brought over to 360. Why did you get into VR? And how do you like it as an artist? We got into VR because it was new and exciting. Having spent most of our careers in TV it was great to be doing something new and challenging. The community around VR and 360 felt inclusive, and it certainly aloud me as an artist to experiment with story telling in a way I hadn’t done since university (which is a tragically long time ago!). I love the feeling of being part of constructing a new visual language, and embracing failures as well as successes. It’s liberating, and myself and my colleagues at VR CITY are embracing VR and 360 video because of this, and seeing where the journey takes us. 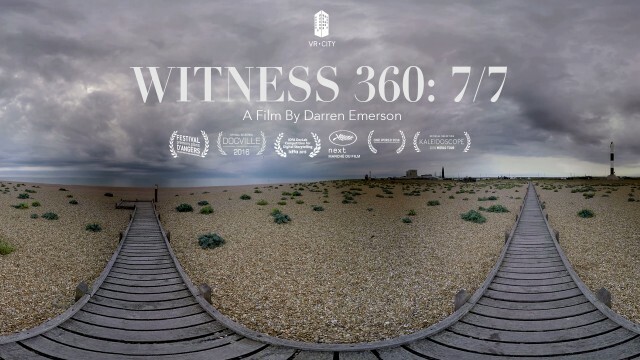 Darren’s first VR film “Witness 360: 7/7” played in competition at IDFA Doc Lab in 2015, and has played at many high profile festivals including Cannes, One World Humanitarian Film Festival, Docville, Docaviv, as well as being part of the MIT Virtually There conference in 2016. In 2016 Darren won the first ever VR commission from Sheffield Doc/Fest and the Site Gallery with support from the UK Arts Council. The resulting film “Invisible” premiered at Sheffield Doc/Fest 2016 and is now touring festivals Internationally. Darren has been invited to speak at VR Labs at CPH:DOX, IDFA Doc Lab, BFI Future Film Fund, I-docs, the One World Humanitarian Film Festival and Cannes. BBC Click: Podcast. Virtual Reality – Where Now? Interview with Darren Emerson. Darren Emerson is a producer, director and co-founder of London production companies VR City and East City Films. Over the last 15 years he has produced everything from music videos, multi-camera OB’s, to documentaries filmed in Serbia, India, Myanmar and Nigeria. Darren is a passionate advocate of VR story-telling and film making. His goal is to create films with a deep sense of emotional resonance between the audience and the subject.